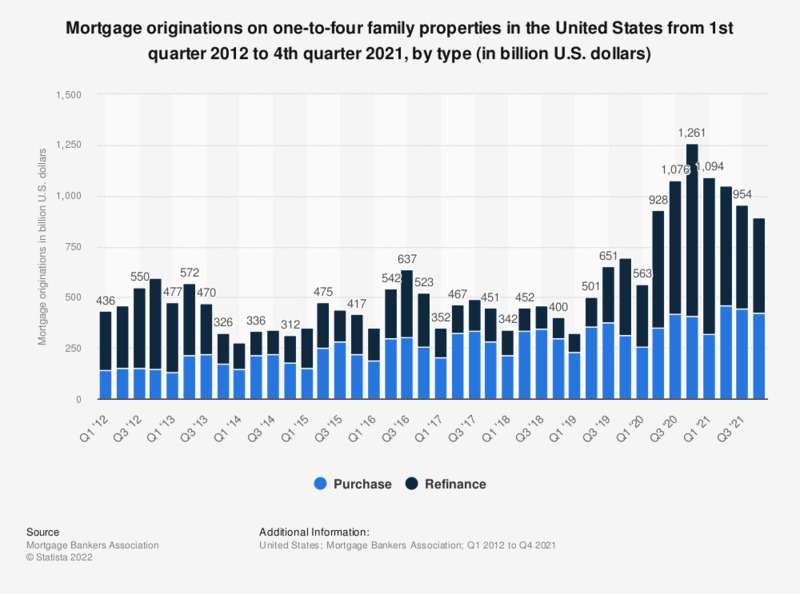 Purchase loan mortgage originations in the third quarter of 2018 amounted to 346 billion U.S. dollars and refinance loan mortgage originations amounted to 111 billion U.S. dollars. Refinance loans were more popular than purchase loans in 2012, but this trend has been changing since early-2014 and became more pronounced as of 2017. A purchase loan is the classic type of mortgage which describes the process by which a home buyer borrows money from a mortgage lender. On the other hand, a refinance loan is obtained by homeowners to replace their existing mortgage with a new loan, which usually reduces the monthly payments, the interest rate or changes it to a fixed rate mortgage. The value of refinance loans has been falling since mid-2013, because the Federal Reserve has been continuously increasing the interest rate since 2014. However, the volume of purchase mortgage originations has been rising due to a stable economy and a thriving housing market.